Those of us who participated in the Twitter tasting for Central Coast Wine Day on March 15, 2012, had a blast tweeting our thoughts on the wines we were tasting that evening. There were many online who, like me, were supplied samples to taste from the Hahn Family of wines. 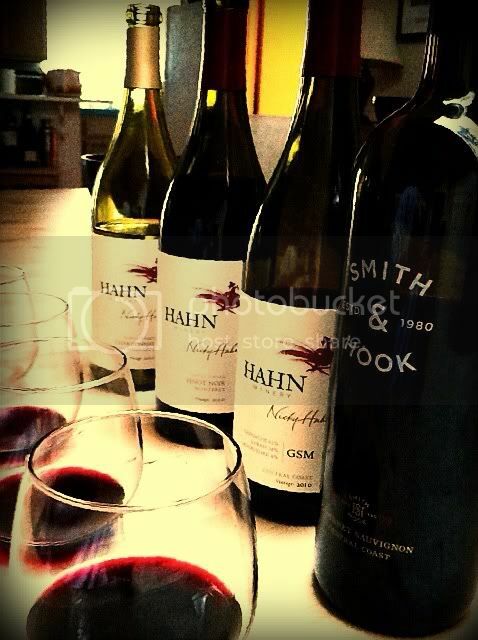 The four Hahn wines we all seemed to be tasting and tweeting were the Hahn Santa Lucia Highlands Chardonnay, Hahn GSM, Hahn Pinot Noir and the Smith & Hook Cabernet Sauvignon. The Hahn Family makes wine in Monterey County, in the Santa Lucia Highlands. Warm climate vineyards there provide a good foothold for Cabernet Sauvignon, and it was that grape that captured the attention of Nicolaus and Gaby Hahn in the mid-seventies. The Hahns turned a couple of neighboring ranches - the Smith Ranch and the Hook Ranch - into vineyards and released their first Smith & Hook Cab in 1980. Nowadays some Paso Robles fruit is added to the fruit from the San Antonio Valley in the southern end of the Santa Lucia Mountains. The tasting tweeters all seemed to really like the Hahn wines quite a bit. There were numerous tweets hailing the Chardonnay as the best, and a seemingly equal number praising the GSM. Backing for the Pinot seemed to get a late start and the Smith & Hook Cab really never seemed to get going, at least to my notice. Winemaker Paul Clifton can feel proud of the love the tweeters were showering upon the fruit of his labor. People seemed genuinely surprised to learn that the price of the Chardonnay, GSM and even the Pinot Noir were well under $20. The Cabernet retails for around $30. 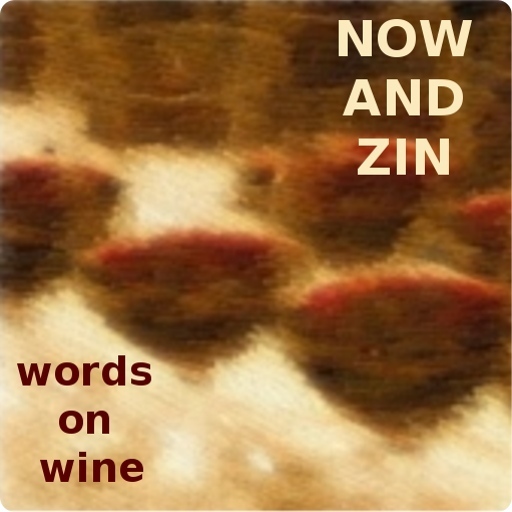 It was great to have a tweet-versation with a gentleman from Florida, who spoke of his trips to Paso Robles and pined for a wine country life. He spoke with reverence of meeting Paso winemaking nobility like Gary Eberle, Kenneth Volk, Stephen Lohr and Stephan Asseo. You can check how the conversations went on Twitter by searching the hashtag #CCWineDay on Twitter. The Hahn Chardonnay Santa Lucia Highlands 2010 is very light in color, with a golden tint. The nose is massive with tropical fruit, pineapple, green apples and oak spice. It tastes tropical too, with some guava and a citrus zest element. Oak shows up here, in restrained fashion, but maybe just a touch more than I usually like. The effect of the oak does not hide the fruit, but it definitely colors it. This wine certainly wowed the Twitter crowd. It was in a dead heat for the title of favorite wine of the night. In the Hahn GSM 2010, the Grenache gives tons of pretty fruit, the Syrah providing darkness and tannins, and the Mourvédre gives it some kick. Medium dark ruby in color, the nose has black cherry and anise in the forefront. A bit of an herbal note comes through as well. On the palate, bright acidity lifts the dark fruit and coffee notes. The Hahn GSM has great tannic structure and a cherry finish. It's a very flavorful and somewhat complex wine. The mix is 62% Grenache, 34% Syrah and 4% Mourvédre, with an alcohol content of 14.5% abv. 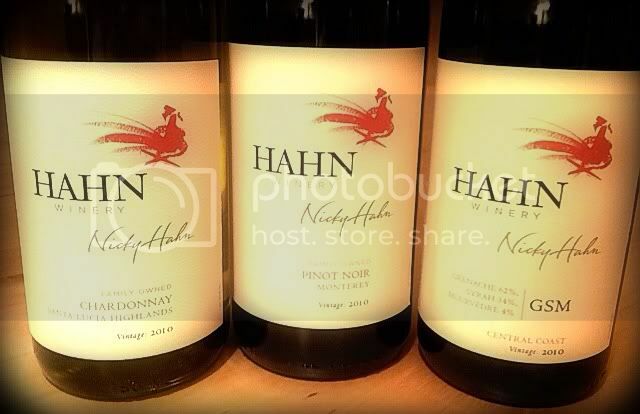 Hahn's Pinot Noir Monterey 2010 has lovely floral aromas with cherry notes. The palate is dominated by black cherry and I find some pretty big spice rack notes. It’s pretty lusty, with nice tannins and a finish that goes forever. It also has a 14.5% alcohol content. I, and others, find it hard to believe it sells for $14 a bottle. 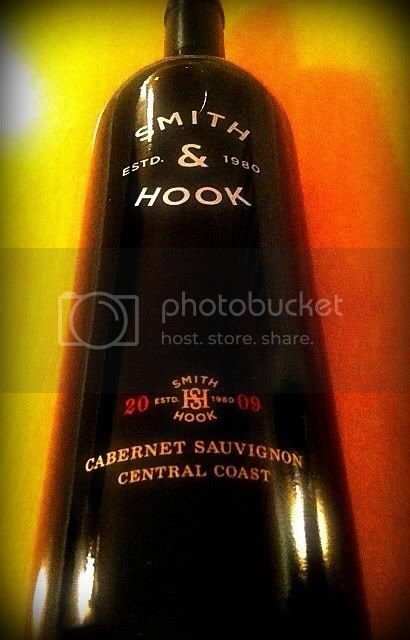 The Smith & Hook Cabernet Sauvignon Central Coast 2009 is a very dark ruby red color. The nose shows dark fruit and oak spice. It feels quite full in the mouth. The wine is very dry and has nice, firm tannins. The flavor of plums and currant appear on the palate, and an earthy quality holds the fruit in check. This is a great steak wine, with some mushrooms on the side. The Sith & Hook Cab retails for $30.